Use these ESL classroom games for a change of pace, community-building, inhibition-reduction, and simple, pain-free practice with the more challenging parts of English grammar and vocabulary. Games serve so many purposes in a language classroom. They’re almost indispensable for encouraging students to actually talk in English, and they make it easier to tolerate the repetition needed to learn difficult structures. They reduce student inhibitions and nervousness to enable deeper learning to take place. They make assessment less scary and still give teachers the information they need on what students have learned and what needs more work. 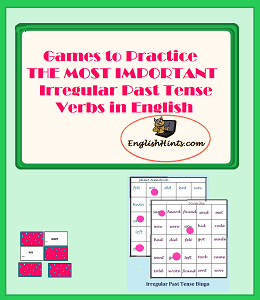 If you want your students to get lots of varied practice with common irregular past tense verbs while enjoying themselves, try this game pdf. 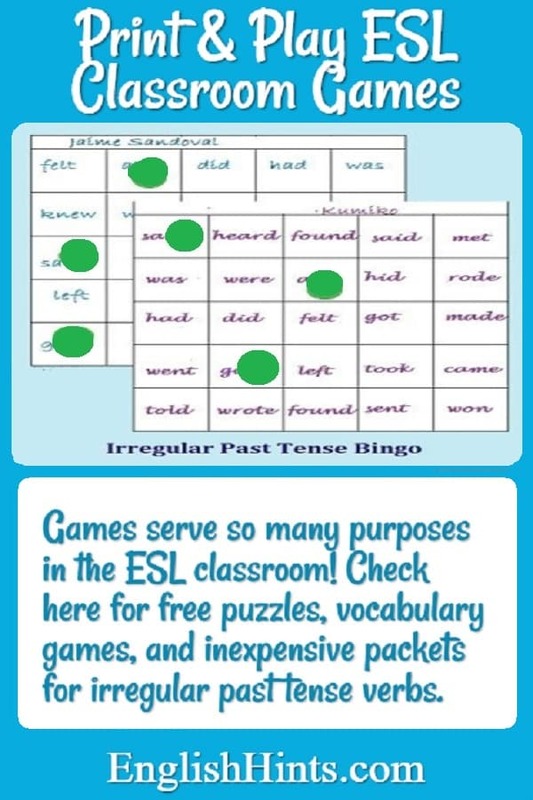 It has suggestions for a number of different kinds of ESL classroom games to practice irregular verbs (memory/Concentration, bingo, liar, Q & A, group competitions, etc.) It provides 6 different sets of 16 memory cards to practice 47* of the most common irregular verbs. (*To be gets two pairs of cards: for is, am/was and are/were). To learn more about memory games and how to play them, see Concentration Games. It also includes word blocks or scrambled sentences to unscramble for a few sentences about nightmares and about Abraham Lincoln, a bingo template, and a team competition gap-fill on immigration and American history. Most of these games require little teacher prep besides printing (and laminating if possible) if you have students who can cut the cards apart. Just $4.50 for 30 pages (26 + cover and answer keys) of easy, low-prep (especially if students can cut out the memory cards) student-approved games to reinforce these important verbs forms. 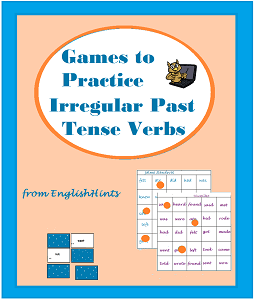 Click the "buy now" button to download "Games to Practice Irregular Past Tense Verbs" for $4.50 now. Two groups of students (1-4 or 5 per set) can play different games at the same time. You could also make additional copies for more students to play—or use them as an optional activity for early finishers, etc. Click the "buy now" button below to download budget-priced "Games to Practice the Most Important Irregular Past Tense Verbs" for $3.50 now. These are the same cards as in Games to Practice Irregular Past Tense Verbs, above, but without the sentence scrambles and team gap-fill. 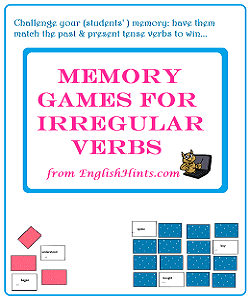 You can try an online, interactive version of Memory (using similar cards with a different cover) at Memory Games for Irregular Verbs, as well as Game 2 and Game 3. It's 17 pages (plus cover) for just $4.00. Click "Buy Now" to download it. Turn a test into a game suggests a team or board game to review for a test. Students play it with cards prepared in advance. It does involve quite a bit of teacher prep (unless you want to improvise questions and ask them yourself, rather than have team members read them to each other), but enables you to customize test prep AND make it fun. He provides free ladder and board templates to download, though the game can easily be played without them. There are also a lot of individual pdf practice pages on ESL Quizzes and Tests and Free Printable Worksheets. Vocabulary Worksheets, Roots, Prefix, and Suffix Worksheets, and Grammar Worksheets have free and inexpensive packets combining different types of practice including games, worksheets, quizzes, group activities, and sometimes web research. Home> ESL Games> Printable ESL Classroom Games.